It all started when I found 2 extra rolls of sugar cookie dough in our deep freezer. I made these pecan lemon bars with one of the rolls, and then did a little experimenting with the other roll. I knew I wanted to make some type of bar that included chocolate — but I noticed that we had a ton of extra peanut butter in the pantry, as well as a bunch of candy bars in the freezer. So when I volunteered to bring a dessert for a BBQ dinner with some friends, I thought it would be the perfect time to try something new. 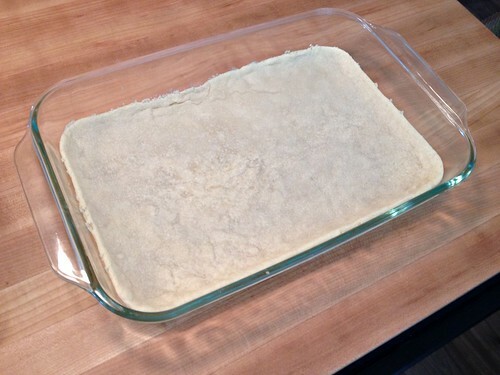 Makes on 9″ x 13″ pan of bars. 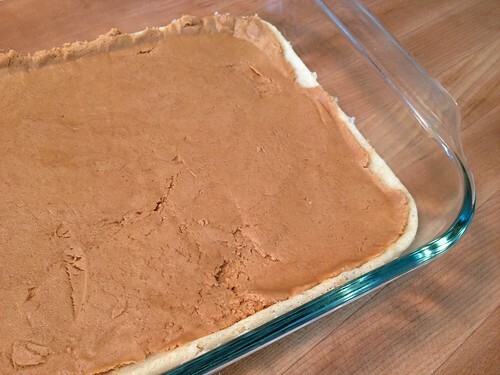 NOTE: The peanut butter mixture will be pretty “thick” so I spread mine as well as I could and then used wax paper to press it down onto the crust. I thought about adding some whipped cream to make it more of a mouse topping, but thought that might be too messy (and I knew a bunch of little kids would be eating these). 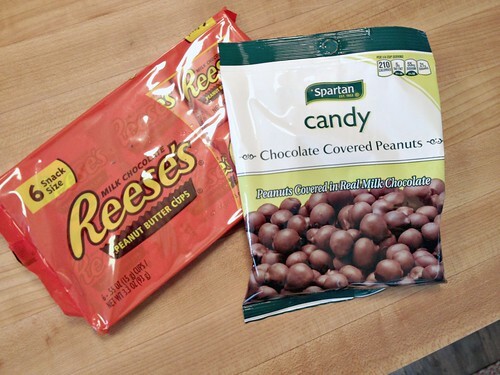 NOTE: Feel free to substitute your favorite nut-butter (or Biscoff spread) in place of the peanut butter, and any yummy chocolate candies you have on hand. I will most definitely be making these bars again as we hardly had any left over to enjoy after our party. 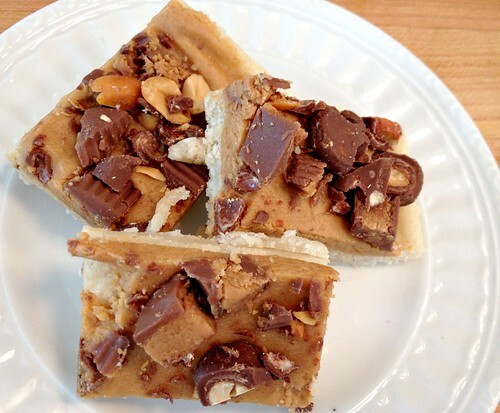 I’m certain that if you like chocolate and peanut butter, you’ll LOVE these cookie bars! What do you think? Would these go over well with your family? These are so simple and delicious! My toddler “helped” me make them yesterday and he definitely approves. We used a sugar cookie mix because that’s what we had. 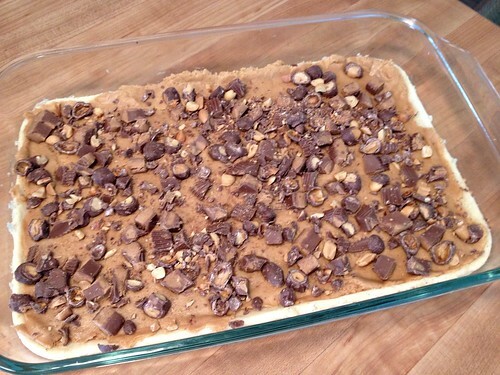 We didn’t have any peanuts on hand so we used a mix of chopped cashews and mini chocolate chips for the 1/2 cup topping. Just made these. Soooo good! Thank you for the recipe! yay — thanks for letting me know! These look so good! 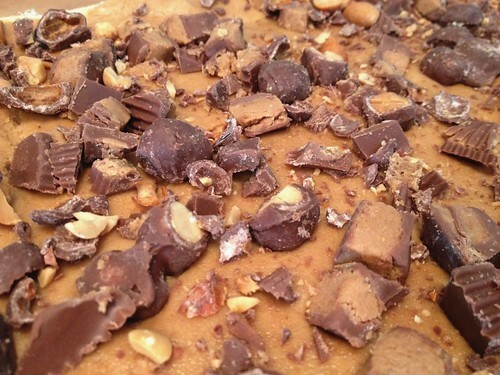 Thank you for the recipe, as I have been craving chocolate and peanut butter like crazy lately. 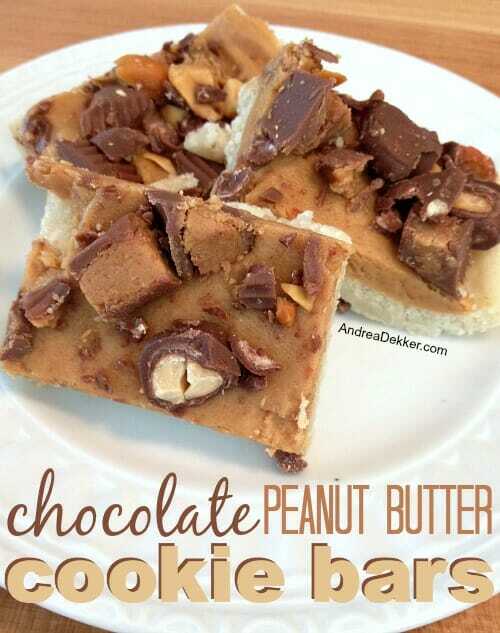 I was thinking about making no-bake cookies, but I might just make these instead. Thanks, again! Thinking about making this with a brownie layer instead of sugar cookies. Those look so good! Too good. Dangerously good!